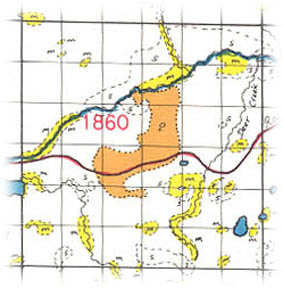 The township now known as Deer Creek (township 134, range 37) was organized by the county commissioners on July 1, 1873. The petition for the Organization of this township bears the date of August 13, 1872, and contains the following names: Orin Hoyt, John Moore, T. F. Moore, Ferdinand Regan, T. Buckley, James Lamb, Zach Briner, Alex Watson, A. M. Stillman, Aleck Buckley, Ben Stillman, C. Morrison, James Gorman and J. H. Saunders. The first election was held at the house of J. M. Brainard on July 26, 1873. Township 134, range 38, was at that time attached to Deer Creek. The name applied to the township was given it on account of the numerous deer which were formerly found within its limits. The pioneer or pioneers who designated this township by this name were evidently so enamored with it that they not only gave it to the township but also to the village and stream in it. This was the twenty-fifth township settled in this county. It is free from lakes and although well drained by Leaf river and its tributary, Deer Creek, this township has a greater acreage of good tillable land than any other township in the country. The farms range in size from eighty to five hundred acres, with the greater percentage containing eighty, one hundred twenty and one hundred sixty acres. The farms are well improved, with good buildings and the farmers are ever striving for the betterment of their land and the improvement of their farming methods. This township is bounded on the north by Newton, on the west by Leaf Lake, on the south by Inman and on the east by Compton. Leaf river enters it from Leaf Lake township in the central part of section 19 and flows in a northeasterly direction through the entire length of the township from west to east, entering Compton from the southeastern corner of section 1. It receives one tributary from the north, Bluff creek, which rises in Newton and runs southwesterly through that township and sections 3, 10 and 11 of Deer Creek township. The entire eastern half of the township is drained by the waters of Deer creek. This small stream rises in Inman township, entering Deer creek in section 35 and flowing into Leaf Lake river in section 1 just before the latter river leaves the township. Another small stream rising in Inman township, flows through the southwestern part of Deer Creek township, and empties into Leaf lake. The latter lake just cuts the western border of this township and covers probably twenty acres of land in section 30. This branch line of the Northern Pacific railroad from Wadena junction to Fergus Falls passes through this township. This road has proven a great help to these farmers in furnishing easy access for their farm products to foreign markets. The present township officers are as follow Supervisors, A. H. Knoble, J. F. Johnson and Charles Kasma; clerk. Thomas Carew; treasurer, P. M. Howard; assessor, Frank Gates; justice, Milton Smith: constable, Fred Truppuka. The village of Deer Creek is the only urban center in the township of the same name and is located on the branch line of the Northern Pacific running between Wadena junction and Fergus Falls. It was platted by its owner, Francis McNamara, and recorded in the office of the register of deeds at the county seat on May 23, 1882. As a result of an election held on December 26, 1899, the town was incorporated. There was considerable opposition to incorporation, as disclosed by the fact that the final vote showed thirty-three for and thirty-one against making the village a distinct political entity. The petition set forth that the village had a population of two hundred and fifty-eight, scatteted over a territory of twenty-five hundred and sixty acres. There were thirty-six signers of the petition and their names are here given that future generations may read the names of the men who started Deer Creek on its urban career. The list follows: William Stewart, D. M. Arbuckle, H. J. Erickson, M. O. Hagler, L. G. Melius, J. W. Kramer, Jr., Frank Scott, George Stewart, William LaHarge, Charley Helmbreck, E. W. Keplinger, E. I. Miller, C. B. Coule, W. L. Junkin, W. H. Wahlfell, L. S. Howell, Charley Thrall, H. W. Freeman, John Wigfield, E. Way, O. B. Spiekerman, H. Robbins, E. O. Carew, Alfred LaBarge, Jay Dewey, Nate Davis, Fred Hammond, Joshua Mead, N. L. Snow, A. L. Burger, N. H. Clemmer, J. M. Regan, John Danner, John Johnson and Fred Peck. The village, which is just ten miles west of Wadena, has a population at present of three hundred and fifty. There are two churches, a Methodist Episcopal and an Evangelical church. The industries and chief business interests of the town consist of a bank, hotel, creamery, flour-mill, brick plant and grain elevator, also a weekly newspaper, The Mirror. The present postmaster is I. A. Tuffs. The present village officers are as follow: President, A. D. Baker; council, Hartwig Nelson, E. Wagner and William Holthuson; clerk, B. A. Hompe; treasurer, F.E. Petzold; justice, T. H. Hastings; constable, J. Hammond. Places of birth for Deer Creek Township in the 1905 state census.